In the bowl of a stand mixer fitted with the dough hook, mix 1/4 cup of the olive oil and the yeast with 1 1/4 cups of water. Let stand until foamy, about 5 minutes. Add both flours and mix on low speed until the dough comes together, about 5 minutes. The dough should be smooth but not sticky; add 1 tablespoon of water if it is too dry. Let rest for 15 minutes. Add the salt and mix on medium-low speed until the dough is stiff and springs back when you touch it, 10 to 15 minutes. Shape into a ball and transfer to a large bowl. Cover the bowl with a damp kitchen towel and let stand in a warm place until the dough is doubled in bulk, about 1 hour. Turn the dough out onto a very lightly floured work surface. Gently stretch it into a square and fold each of the 4 sides into the center. Flip the dough seam side down and return to the bowl. Cover with the damp towel and let rise in a warm place until it is doubled in bulk and springs back slowly after you touch it, about 1 hour. Line 2 large rimmed baking sheets with parchment paper. Turn the dough out onto a lightly floured work surface and, using a large knife or a bench scraper, cut it into 16 equal portions. 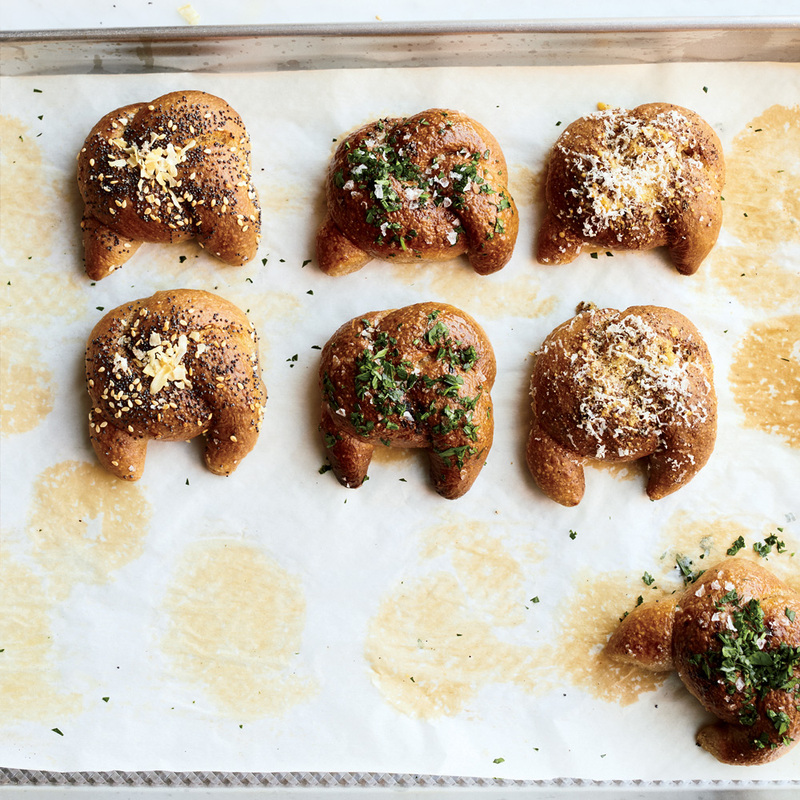 Gently roll each piece of dough into a ball and carefully transfer to the prepared baking sheets. Loosely cover with damp kitchen towels and let stand in a warm place for 30 minutes. Invert 1 ball of dough onto an unfloured work surface so it is sticky side up. Using your pointer fingers, press the outside edges of the dough together to seal the sticky side. Using your palm, flatten the dough, then turn it so the longer side is facing you. Working from the opposite side, fold the dough over itself 3 or 4 times to form a tight log. Roll the log into a 12-inch rope, then tie into a loose knot with 2 long tails. Transfer the knot to the baking sheet and repeat with the remaining balls of dough. Carefully slide each baking sheet into a clean, unscented 13-gallon plastic kitchen bag and tie closed; leave air in the bags to prevent the plastic from touching the dough. Let the knots rise in a warm place until the dough is puffed and springs back slowly after you touch it, about 1 hour. Meanwhile, preheat the oven to 425°. In a medium saucepan, melt the butter in the remaining 1 cup of olive oil. Add the garlic and cook over low heat, stirring occasionally, until it is very soft and golden, about 45 minutes. Keep warm over very low heat. Brush the knots with some of the garlic butter, leaving the garlic pieces behind, and top with freshly grated Parmigiano-Reggiano, flaky sea salt and freshly ground black pepper. Bake the knots for about 20 minutes, until puffed and browned. Drizzle with more garlic butter and garnish with more cheese and pepper. Serve warm. Farmer Ground spelt flour can be found at Whole Foods, but any local, finely ground spelt flour will work here.